You might remember when we found a little pup on the side of the road all alone in the rain. Well, he’s not so little anymore! He’s been living outside our house with the other dog that was left behind when the neighbours moved (despite them telling us they would take him next week… next week… next week…). 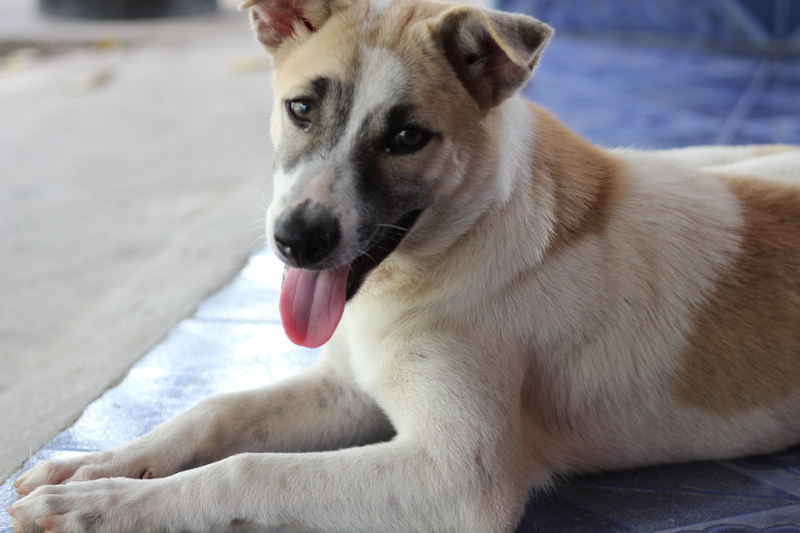 Patches is a bit of a naughty boy, but he’s not really ours to train so we’ve got as far as gettin him to sit and he will come to us when we call him – which is pretty impressive for a street dog! Anyway, thought I would give you a little update on the not-so-small puppy that we call Patches. He is a bit of a looker if I say so myself! Posted on November 4, 2013 October 11, 2014 by cornishkyliePosted in Day to day lifeTagged animal photography, animals, dog, photography, puppy, rescue animal, stray, street dogs, street dogs of thailand, Thailand.